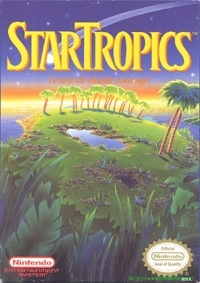 StarTropics was a game released by Nintendo in 1990 for the NES. This game was released only in the United States and Europe despite being developed in Japan. One of the greatest features of StarTropics is the immersive story which contains some twists and turns along the way. StarTropics revolves around Mike Jones, a star pitcher from Seattle. He comes to C-Island to visit his uncle, an archaeologist named Dr. Steve Jones, after receiving a letter from him. Uniquely, this letter was actually packaged with the game and addressed to the player. Just as Mike carries the letter inside the game, so too must the player keep it for later use. During his visit, Mike discovers that his uncle has been abducted by aliens. Wielding an island yo-yo, Mike travels from isle to isle and fights his way through caves searching for clues to his uncle's capture. 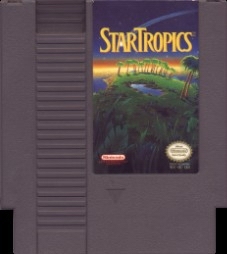 StarTropics is played from a 2D top-down perspective, similar to The Legend of Zelda (in the dungeon areas) and various RPGs on the NES (village/overworld areas). The game is divided into a series of chapters through which the story progresses. In each chapter, Mike initially walks around the island and the villages obtaining information before entering the dungeon levels. Mike acquires an assortment of weapons and items to help him defeat the various enemies and bosses he encounters throughout the game.